Learn to navigate the spot gold and gold futures markets with 14-year industry veteran Drew Rathgeber as your guide. In our exclusive Survival Course in Precious Metals, you have access to the same tips and strategies the pros use when trading the gold and silver markets. 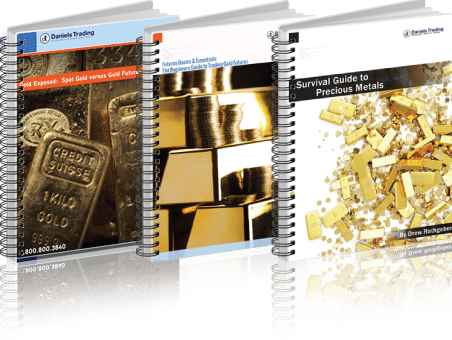 Survival Course in Precious Metals contains THREE complete guides and includes an educational webinar, putting insider knowledge of the markets at your fingertips. Drew began his career at one of the nation’s largest physical spot bullion dealers in 2003. From there he made the transition into commodity futures in 2006. Because he has worked on both sides of the fence, ‘Spot’ and ‘Futures’, he has an astute understanding of how the markets can work for Retail Traders, Hedgers, and Commercials. He can use this knowledge to help investors and traders alike. Today you can see Drew working in many different capacities in the commodity futures markets. He is the creator of his own advisory service AccuMarkarkets which can be emailed directly to you, or you can sign up for his weekly newsletter, Rath Overlay. Which highlights commodity futures markets and possible future events using his time-tested yet simple strategy.